On several occasions, we have reported on how religious communities have spoken up in support of the indigenous efforts to stop DAPL. It is important to highlight these statements, as they remind us that this is not just about politics, but a spiritual issue and a commentary on what these pipeline decisions say about our deepest beliefs and values. 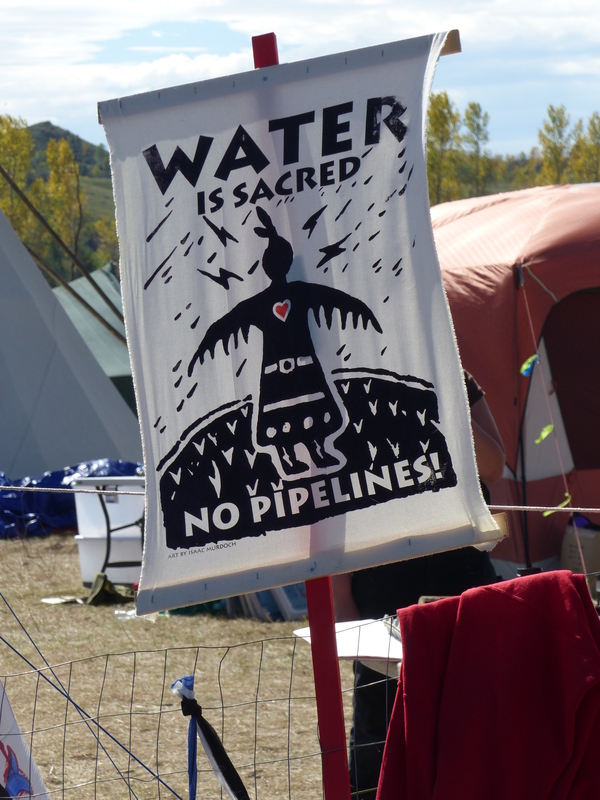 The latest news comes from Baptist News Global: Clergy from across U.S. to stand in solidarity with indigenous ‘water protectors’ at Standing Rock. On Oct. 25, a number of United Methodist Bishops in the western United States sent a letter to President Obama stating their support for the Standing Rock Sioux Nation and its opposition to the pipeline. Signers were: Bishop Elaine JW Stanovsky, Greater Northwest Area, Bishop Melvin Talbert, Ret. Bishop Elias Galvan, Ret., Bishop Mary Ann Swenson, Ret., Bishop Beverly Shamana, Ret., Bishop Warner Brown, Ret., Bishop Robert Hoshibata, Desert Southwest Area, Bishop Minerva Carcaño, California-Nevada Area, Bishop Grant Hagiya, California-Pacific Area, and Bishop Karen Oliveto, Mountain Sky Area. THIS FRIDAY: Come to the opening reception of “On Fertile Ground: Native Artists of the Upper Midwest,” Friday, Nov. 4, at All My Relations Gallery, 1414 Franklin Ave. E., 6-8 p.m. There will be Music from DJ Rawskillz, food from Powwow Grounds, and art from more than 45 contemporary Native artists from around the Midwest region! There will be a limited number of FREE signed posters available at the opening. The show runs through Jan. 20. The MIA is hosting a conversation with artist Andrea Carlson (Anishinaabe, French and Scandinavian) about her new work “Let: An Act of Reverse Incorporation” Thursday, Nov. 10 at 6:30 p.m. The authority of museums to tell the stories of indigenous objects came from a history of cultural dominance. As empires expanded their domains, collecting objects from the indigenous inhabitants was seen as collecting for posterity in anticipation of cultural assimilation. The term “posterity” is important because colonial empires and their surrogates were buying futures in indigenous cultural scarcity and death. The Nov. 10 event will feature a video of a public performance piece by Carlson and her collaborators. They took sculptural replicas of various objects from Mia’s collection and carried them outside. Responses to these and other objects in the permanent collection are discussed within the video. The film and labels found throughout Mia invite audience members to reflect upon and interrogate the collection and display of particular objects in encyclopedic museums. We close this post with an item to put the DAPL protest in a broader historical context. On this day in history, Nov. 3, 1969, a special subcommittee of the U.S. Senate issued what has become known as The Kennedy Report on Indian Education. The report found that the dominant policy of the federal government toward the American Indian had been one of coercive assimilation, and that has had strong negative influences on national attitudes towards Indians and disastrous effects on the education of Indian children. The report recommended that the development of effective educational programs for Indian children become a high federal priority, and makes numerous recommendations. Here is a link to the full report. That was 47 years ago. Today, by many measures such as graduation rates, American Indians still do not succeed in U.S. schools. The whole DAPL process is a symptom of much deeper historical and ongoing problems with how the U.S. works with Native American communities and nations.